For the first time on bahaiteachings.org, we introduced our readers to White Buffalo Maiden in The Return of White Buffalo Calf Woman (Part 3 of the Native American Messengers of God series). 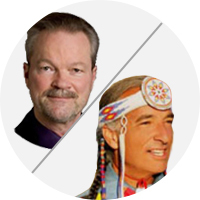 Today we’ll discuss that fascinating subject with Kevin Locke, the famed Lakota Hoop Dancer and Baha’i. [Buck] Kevin, can you tell us how you have come to know, first-hand, the teachings of White Buffalo Maiden? [Locke] I don’t have any title. I am not a chief. I am not what non-Native people might think of as a “medicine man.” Even though I consider myself a world citizen, I do have a strong connection to the Lakota part of my heritage, especially the language and culture, music, dance, etc. I can say for certain that my involvement in the Lakota spiritual heritage led me directly to the revelation of Baha’u’llah, founder of the Baha’i Faith. 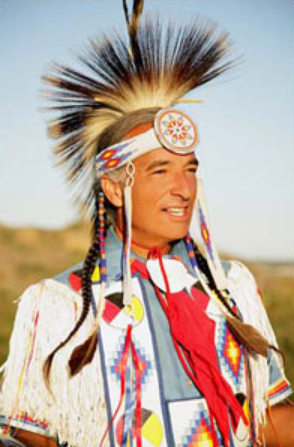 I have been involved in the Lakota spiritual heritage for well over 40 years. So I was able to learn first-hand from the older generation of tradition keepers, many of whom spoke only the Lakota language, and hardly a word of English! [Buck] Who is White Buffalo Maiden? Why is she so important? [Locke] To anthropologists, White Buffalo Maiden was a Lakota “culture hero.” For the indigenous people here in South Dakota, White Buffalo Maiden is the one who, long ago, delivered my people, the Lakota, from their wretched condition of darkness, despair, poverty and remoteness—and summoned them to arise to become noble grandchildren of the “Heavenly Grandfather” above. Unquestionably, White Buffalo Maiden is the single most important and sacred being to have ever appeared among the Lakota. [Locke] Yes. Such disdain is more than general. I’d say it’s universal, among my people. [Buck] In addition to being Lakota, and preserving and honoring the sacred heritage of White Buffalo Maiden—the sacred rites, dances, songs and values that the Maiden brought and taught—you are also well-known as a Native American Baha’i. From that perspective, who would you say that White Buffalo Maiden is, in Baha’i terms? [Locke] Speaking personally as a Native American Baha’i, White Buffalo Maiden could be thought of as a holy soul, a divine being, an emissary from God, perhaps even a Prophet or Manifestation of God. That was the belief of my late mother, Patricia Locke. [Buck] In addition to sacred rituals, did White Buffalo Maiden bring spiritual principles and social laws? [Locke] Yes. White Buffalo Maiden brought spiritual teachings, sacred rites, social laws, and prophecies—just as the prophets and founders of all great Faiths do. Since my Lakota ancestors had no written language, these teachings were embedded in sacred songs. Each sacred rite is emblematic of a spiritual principle or social law. Each and every time the sacred rituals are performed, doing so invokes spiritual principles and evokes ideal social relations—transporting the practitioner to that sacred point which connects this world with the world beyond. [Buck] Are White Buffalo Maiden’s sacred teachings symbolized by the rituals themselves? [Locke] Yes. The teachings are communicated through the rituals. 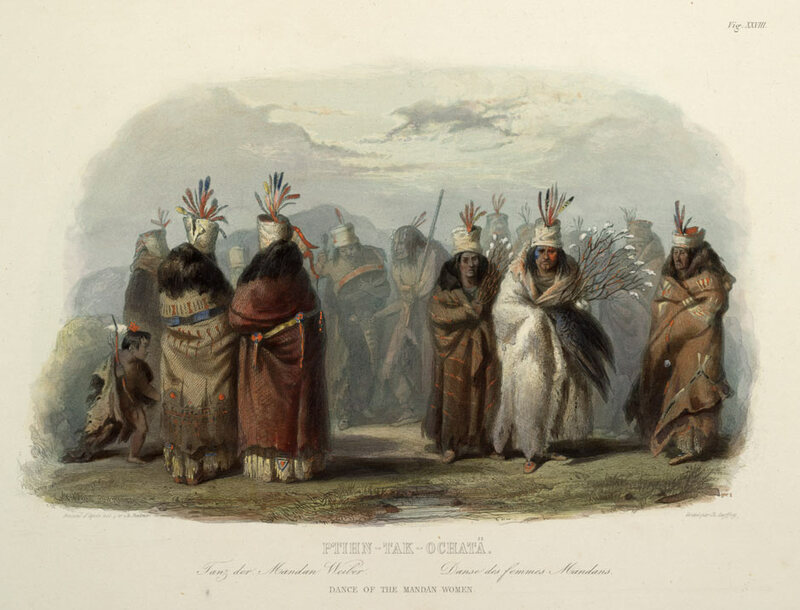 For instance, the woman’s coming of age ceremony involves the Buffalo Dance. The problem arises when the language falls into disuse. Then the dance becomes disconnected from its symbolic meaning and the efficacy is lost. [Buck] Are the sacred principles also enshrined in the sacred songs traditionally attributed to White Buffalo Maiden? [Locke] Yes. Even though the lyrics are terse, they are laden with layers of meaning. [Buck] You and I had previously talked about the “Four Songs” and the “Seven Sacred Rites” ascribed to White Buffalo Maiden—as famously described in Joseph Epes Brown’s bestselling 1953 book, The Sacred Pipe: Black Elk’s Account of the Seven Sacred Rites of the Oglala Sioux. You told me that this traditional Lakota song was never traditionally intoned on the flute. In other words, the traditional “Song of the White Buffalo Maiden,” which is attributed to White Buffalo Maiden herself, is a vocal composition only. What you have done is to compose, on the flute, an instrumental version, to honor the Maiden. Can you play for us “Song of the White Buffalo Calf Maiden” (“I Am Walking”)? [Locke] Sure. Listen to Song of the White Buffalo Maiden. [Locke] I first heard this song from Joseph Flying Bye, who, as a youth, had attended sun dances conducted by One Bull (nephew of Sitting Bull). My personal interpretation is that the Maiden here is likening her message or dispensation to the onset of spring. “Breath” (tȟaŋíŋyaŋ) more properly means “visibly, plainly, clearly, without concealment.” In this sense the “breath” is the divine holy waftings from the unseen realm, as is the Maiden’s voice. The “visible” part is the effect of this heavenly wafting upon the collective heart of the “Buffalo Nation” (as the Lakota are also known), analogous to the transformation from winter into spring. In fact, the “Buffalo Nation” is the original name of my people, because of their dependence upon the buffalo for physical sustenance. The Maiden made it known that the people no longer needed to depend upon the buffalo alone, but that “Grandfather” (the “Great Spirit,” or “God”) would provide. She named the people; “Lakȟóta.” This has been translated as “allies,” “friends,” “peace”—but really refers to compliance with the divine order or will. “Walúta” is translated here as “scarlet relic.” It has also been translated as “something red, ancient and sacred.” It refers to the sacred pipe that the Maiden brought which, in turn, represents the Covenant between White Buffalo Maiden and the Buffalo Nation and, more generally, the Messenger of God, such as Baha’u’llah for this day and age, and the people for whom the Messenger has come. I'm curious about something. I've always heard Her referred to as White Buffalo Calf Woman. Is that another name for Her? Very good, thank you for sharing, we need to know and learn more so that our hearts, soul and spirits continue to seek peace and unity amongst all the people of the world. May the Buffalo Nation shine and play its role in an ever advancing civilization. God is the Compassionate, the All-Merciful. Much to learn based in the richness within this tradition, prophesy and ongoing legacy for all. I enjoyed this discourse and look forward to the meaning in the pipe ceremony. Thank you. I would like to know more about this. This is an excellent introduction to an amazing account of enhance spirituality coming to and imbuing the Buffalo Nation. Thank you.